Print or photocopy sufficient instructions for one between three or four children. 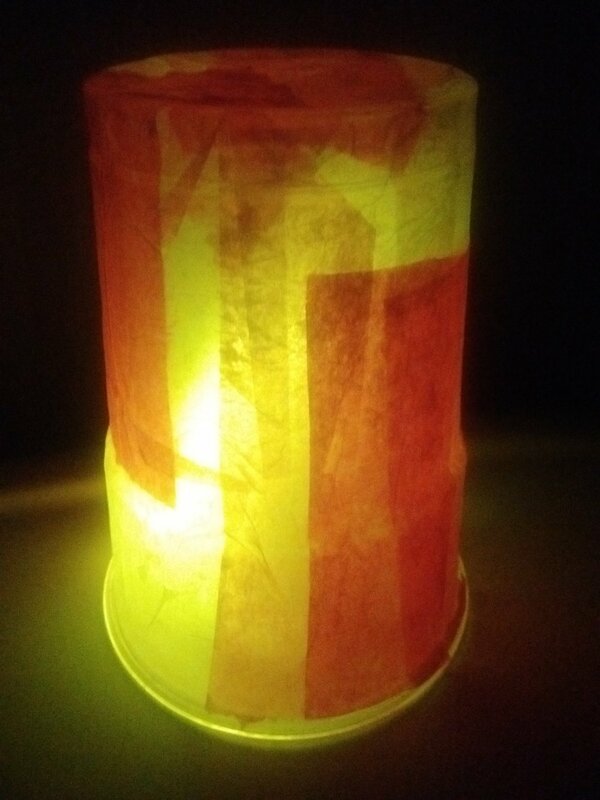 Make a sample ‘pillar of fire nightlight’ so the children know what they are making. 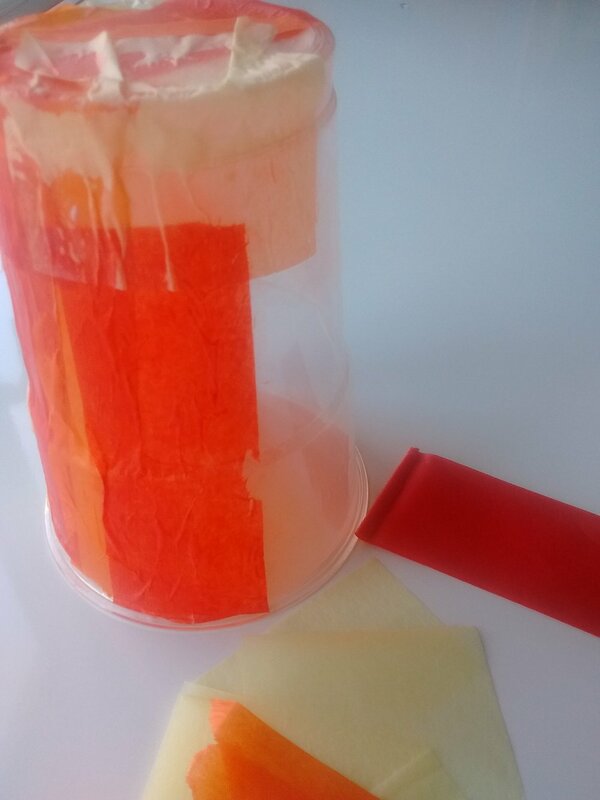 Cut the tissue paper into strips or semi-circles and dilute the PVA with a little water. You need an approximate ratio of 1:3, glue to water. 1. Dilute the PVA with a little water. You need an approximate ratio of 1:3, glue to water. Cut the tissue paper into strips or semi-circles. Brush glue onto the cup then stick the strips of paper to it. The strips need to completely cover the cup. 2. Brush a little more glue over the cup once it is covered in paper to make sure all the strips are stuck down. 4. ...or take the glow sticks home with you and, if it is OK with your family, at night time you could set up your nightlight in a dark room and watch it glow. Table and floor coverings and aprons. Print or photocopy sufficient door hanger templates for one per child. Pour a little red paint into a spray bottle and dilute with water. If you have enough spray bottles repeat this with the yellow and orange paint. 1.Give each child a template and help them to cut it out. 2. Demonstrate how to tear up pieces of cotton wool and stick them to the ‘cloud’ side of the templates. 3. Help the children to fold their templates in half and glue the two halves together. 4. In a suitable area cover the floor and a small table. Encourage one child at a time to put on an apron and place their template ‘flame side' up on the covered table. Assist the child to spray a little paint onto their template. 5. Leave the templates somewhere to dry. If too much paint has been sprayed on to the templates remove the excess with a piece of kitchen towel.